Xanax, also known as alprazolam, is a widely prescribed medication that is used to treat mild to severe anxiety. Like many benzodiazepines, Xanax street names are commonly used by people abusing the drugs in an effort to keep law enforcement and others misinformed or in the “dark” about the conversations that are taking place. According to the DEA, benzodiazepines such as Xanax are often referred to as “benzos” or “downers” but they can also be called a wide range of other terms too. 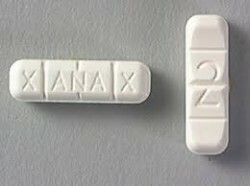 Many Xanax pills come in ‘bars’ and are referred to by that name. Anytime you hear the name “bar” or “handlebar” or “Xanibar” the reference is to the 2mg pills that are commonly prescribed to patients with moderate to severe anxiety. These Xanax pills are long and slender in shape and can be broken down into smaller pieces that are about .5mg each. Whether you’re a concerned caregiver, family member, spouse, or friend, it is important to have a strong understanding of the various names that can be used to talk about drugs. Users, teens and children especially but adults too, will do anything to mask the nature of their conversation in order to prevent others from knowing what is going on around them. If you are unaware of the terminology and street names that are being used to discuss drugs, you could be overlooking a serious problem that is occurring right in front of you. Signs of Xanax Addiction - Whether taken as prescribed or abused, Xanax is known to be a drug with a potential for dependence and addiction. Addiction signs include an inability to control your us of the drug, taking more than prescribed regularly, and having multiple prescriptions from different doctors. Types of Xanax Addiction Treatment - Xanax, though commonly prescribed, is actually an addictive substance. Once addicted it becomes very difficult to stop using it on your own. Xanax rehab programs use counseling, behavioral therapy, support groups and other methods to help you overcome and recover.